In recent times, public awareness regarding the dangers of sugar is increasing daily. But why is this anti-sugar movement only gaining enough strength and support to make a real difference now? The truth is that we haven't had access to the full set of data until recent times. Additionally, we have been lied to and deceived by the food industry. This deception is especially the case regarding the sugar industry and select scientists who have covered up sugar's ill effects. In essence, these people sold out our health for corporate and personal profit. Unfortunately, the American (and worldwide) public are experiencing the consequences. 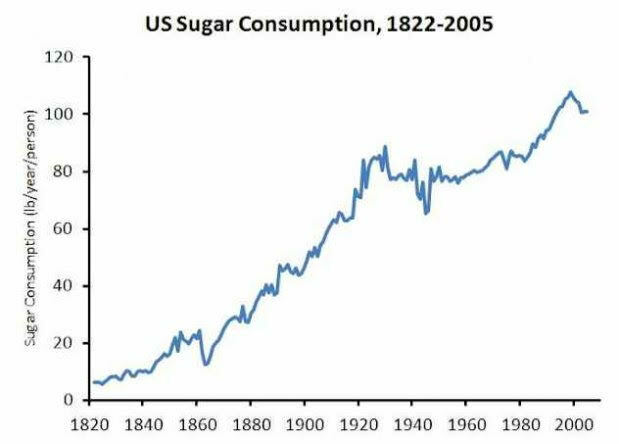 As we replaced natural sources of fat for sugar (and excess carbohydrate in general), soaring rates of obesity, type 2 diabetes, cardiovascular disease and other conditions of the metabolic syndrome soon followed. If we take a look at the charts, based on datasets by the National Health and Nutrition Examination Survey, a federal program of studies that assess Americans' health and nutritional status conducted by the Centers for Disease Control and Prevention, it is evident that, as we increased sugar consumption and cut back on animal fats, obesity skyrocketed. 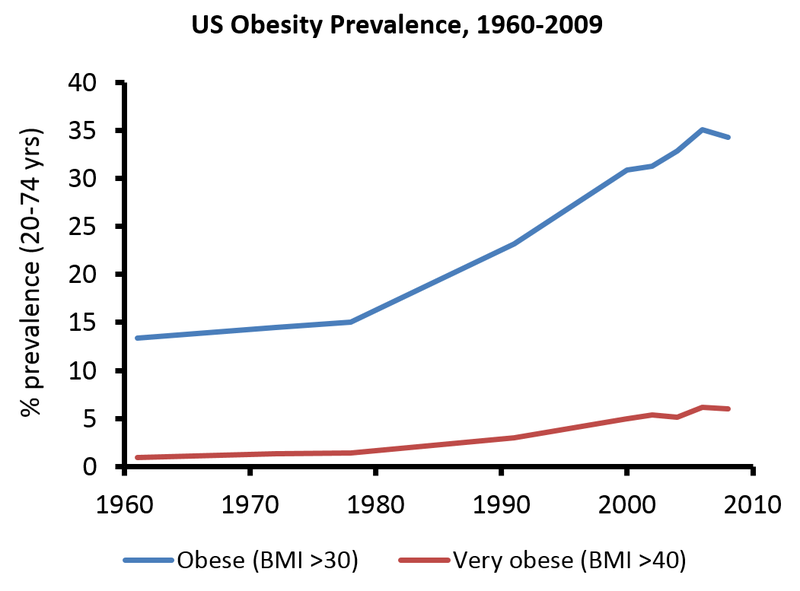 The result: rapidly growing rates of obesity. In addition, the CDC shockingly predict that one in three American adults will have diabetes by 2050. An important question to ask is this: Why are we advised to restrict animal fat but told that sugar can be part of a "healthy, balanced diet"? Remarkably, the 2015-2020 dietary guidelines for Americans suggest that it's acceptable to eat up to 10 percent of total calories from added sugar. This amount is approximately 12 teaspoons per day based on a 2,000-calorie diet. It's important to realize that this number is solely related to added sugar, and ignores the possibility of large amounts of dietary sugars coming from fruit juice—which can also be harmful in excess. Contrary to this advice, we have studies showing the perils of sugar everywhere. These studies include randomized controlled trials (RCT) recognized as "the gold standard" of science. Although we are advised to minimize the amount of red meat in our diet, not one RCT finds danger in unprocessed red meat consumption. In fact, red meat is one of the most nutrient-dense foods in our diet and contributes an enormous amount of beneficial nutrients. In short, the science is now in, but we are still waiting for public policy to catch up. The majority of educational institutes are still teaching our dietitians that fat needs to be restricted. Nutrition policy tells us we should strive for a "balanced" diet (that may include industrial foods high in sugar). Generally speaking, this education translates into the health advice given to the public. Despite following this health advice, people then wonder why they are gaining weight despite adherence to the dietary guidelines. In this regard, it's particularly important to understand that many people suffering from obesity are metabolically broken. Following years of over-indulgence on refined foods, they have slowly become insulin resistant. Essentially, they are intolerant to carbohydrate. Despite this, they are recommended to eat the same one-size-fits-all high-carbohydrate diet as everyone else. So why is such a relaxed attitude taken to sugar restriction? Perhaps it is because sugar is more profitable and has a massive industrial juggernaut behind it? It's certainly worth questioning why our society normalizes sugar consumption. Especially when we have an inherent fear of saturated fat. In fact, the answer to this issue requires only one word: Politics. Unfortunately, politics heavily influences public health and nutrition. There are countless examples of big money dictating public policy. Over the past few weeks, you may have seen headline stories in the press regarding nutrition politics. These stories all revolve around a shocking reveal in a recently published academic paper. The year was 1967 and America was in a panic over the emerging cardiovascular heart disease epidemic. While considered a rare occurrence just a few short decades prior, a media frenzy now surrounded the recent spate of heart attacks. Even the U.S. president himself was not immune; President Dwight D. Eisenhower suffered a very public heart attack in the 1950s. Understandably, the terrified public was desperate to reduce their risk and craved to know the cause of this rapidly increasing phenomenon. The finger of blame hovered over two potential dietary culprits: saturated fat and sugar. With hindsight, Ancel Key's hypothesis is controversial, and many people view it as bad science. At the time, though, the theory had many supporters. Similarly, the theory of sugar being the cause of heart disease was quickly garnering popularity with several research papers supporting Professor Yudkin's theory. Unbeknownst to the public, deeply concerned sugar industry executives were secretly funding a large review paper in the background. The aim of the study was to review the existing evidence, end all doubt and show that sugar was innocent. With this intention, the Sugar Research Foundation (now known as the sugar industry) paid a significant sum of money to prominent Harvard Scientists for a favorable outcome. With August 1967 came the paper's release into the public realm. The conclusion read: "There is no doubt that the only dietary intervention required to prevent cardiovascular heart disease is to reduce dietary cholesterol and substitute polyunsaturated fat for saturated fat in the American diet." In summary, they outright vilified saturated fat while sugar escaped criticism. 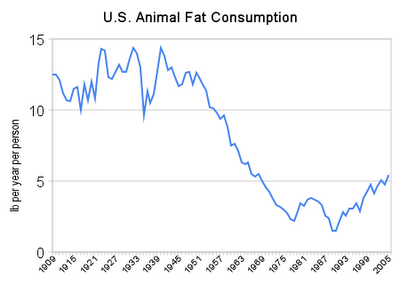 Not surprisingly, the paper made media headlines and damaged saturated fat beyond repair. The debate over the culprit behind heart disease was now largely over, and the subsequent dietary guidelines for Americans followed the paper's conclusion to the letter. If you are wondering about the process the scientists used in the study, it was biased beyond belief. Firstly, the studies used in the review were hand-selected by the SRF to ensure some of the most anti-sugar papers wouldn't cause problems. Secondly, in their analysis, the researchers played down every link between sugar and heart disease. On the other hand, they strongly highlighted any association between heart disease and saturated fat. Regarding more clear connections between sugar and heart disease, the scientists directly attacked whoever did the research. Rather than note the data, they just cited it as "flawed methodology" or even "incompetence." Most significantly, this study both directly and indirectly influenced public health policies for decades. And important to realize is that this is not the only time the food industry has tried to use deceptive tactics like this. Only last year, recently uncovered reports showed how Coca-Cola "financially sponsored" dietitians and other nutrition professionals to endorse their drinks. Each person received a set fee from Coca-Cola depending on their status. Back in 2003, the sugar industry even managed to threaten the World Health Organization (WHO) into silence. These threats came in response to the WHO's plan to recommend an upper cap limit on sugar. So just what has the sugar industry been trying to hide? The first thing to point out is sugar can be extremely addictive. In our brain, we have what we could call a 'reward center.' When we feel enjoyment or pleasure, dopamine is released to make us feel good. This reminds us to seek out the thing that caused this feeling in the future. Hard drugs such as opiates have this effect on the brain, and that's why they are so addictive to people who use them. A lesser known fact is that sugar stimulates this very same process to make people feel good. If you're eating sugar every day, then it becomes increasingly difficult to stop. Some people have a hard time believing that sugar addiction is a real thing. But animal studies have shown just how addictive sucrose can be here, here and here. For someone who is currently dealing with a sugar addiction, seeking support from close friends can make a big difference. Remove all sources of sugar from the house, and increase the amounts of healthy fats for satiety. Some great examples of healthy fats are meat, fish, dairy, nuts, avocado, olives, and dark chocolate. The first days are the hardest, but it does get less difficult with time. There is a dark side to sugar. Some of the recent findings over the past few years include how higher sugar intake increases our risk for cancer through inducing tumor growth pathways, hyperinsulinemia and activating oncogenic pathways. Cancer is not the only disease associated with the sweet white powder, though. Strong links also exist to cardiovascular disease, diabetes, fatty liver disease and Alzheimer's. The very best thing you can do to avoid sugar is to stop buying processed food with large ingredient labels. Rather than this, opt for real single-ingredient foods as much as possible; meat, fish, fruit, vegetables, nuts, seeds. These are the nutritious foods that sustained human health for centuries. Only when we became exposed to industrially processed foods did chronic disease rates begin to soar. I strongly recommend a natural eating regime like the above, but if you're not ready for this step then at least check labels. While there is no such thing as a healthy amount of sugar, you can make sure you're keeping consumption as low as possible. Lastly, be aware that nutrition labels are devious: Manufacturers often try hide sugar by using many different names. Make yourself familiar with these names. Unfortunately, a "healthy sugar" doesn't exist. Whether it's agave, coconut sugar, or any other version, all have a similar effect on blood sugar levels. However, we can safely say high-fructose corn syrup is the worst form of sugar. If you need a sugar substitute, then erythritol may be worth a look. But if you ever do have a sweet tooth, then it's probably best to do as our ancestors did. Eat a piece of fruit. Michael Joseph is a nutrition educator. He writes regularly at Nutrition Advance.